The Institute for Health Metrics and Evaluation says in the last decade, the number of people killed by alcohol increased 35 percent overall, and a staggering 85 percent among women. Experts point to a society that promotes drinking in movies and on television, and a "mommy wine culture" seen on products and in social media. 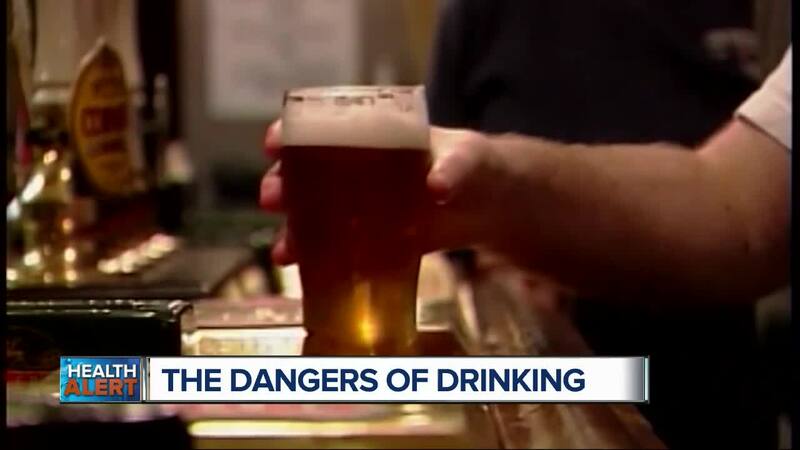 (WXYZ) — The Institute for Health Metrics and Evaluation says in the last decade, the number of people killed by alcohol increased 35 percent overall, and a staggering 85 percent among women. Experts point to a society that promotes drinking in movies and on television, and a "mommy wine culture" seen on products and in social media. 7 Action News spoke to Michael Choly, a man in recovery about his struggles. He spoke about how alcohol has become an accepted part of a successful life. He embraced that idea. He worked hard and achieve. He drank to celebrate and let off steam. “I had been around the world, checked all the boxes, and got all the t-shirts. There were no holds barred,” said Choly. Success gave him flexibility, and Choly found himself using that time to reward himself by drinking more. Then he got behind the wheel with a blood alcohol content more than twice the legal limit and got busted. “When I was in front of that judge, her words didn’t affect me at all. Did she know who I was? That is how big of an ego I had,” said Choly. The judge ordered him into therapy. In treatment he realized his family life was a mess because of alcohol. “The line of dependency is the substance I used to use to get relief from my problems, is now the cause of my problems,” said Judith Malinowski, a clinical psychologist at Ascension Behavioral Health in Novi. Malinowski says the fact alcohol is such a part of our culture makes it even more dangerous, especially this time of year. “There’s more parties. There’s more celebrations. It’s also a very difficult time because there is a myth that the holiday season is this wonderful Norman Rockwell time. Everyone gets together and is loving, has enough money and it is wonderful. It is one of the most stressful times of the year,” said Malinowski. That myth can magnify stress and for some lead to drinking. A question many don’t ask themselves is: How much is too much? Experts say for some people one drink is too much. For others, moderation is key. The CDC defines heavy drinking as more than 8 drinks a week for women or 15 drinks a week for men. It may be surprising to some that alcohol, though legal, or perhaps because it is legal, is more dangerous statistically than illicit drugs. While the opioid crisis claims about 72 ,000 lives a year, the CDC reports that excessive drinking kills about 88,000 people a year. Malinowski knows first hand the cost. “There are only three end results of alcoholism. That is death, insanity, or recovery. And my husband died at the age of 34,” said Malinowski. Her husband, Ray Malinowski, died in 1990 leaving behind their two sons. “I didn’t know that through the journey I had through him I would end up in counseling. It has made me far more compassionate for the people who have these diseases,” she said. Brenner watched alcoholism slowly kill her mom as she started the Alliance of Coalitions for Healthy Communities in Auburn Hills. It provides support and education to help people prevent and overcome substance abuse. She wants people to know alcoholism hurts far more people than just the alcoholic. The victims are countless. “How many more people do we have to lose to it? How is it with all the information we have people don’t know?” she asks. Michael Choly works with Brenner to help others fighting addiction. He has now been sober for four years and wants the message out: there is help. “For four years now I have gone to bed every night without a regret, without a worry, without frustration. That is true. That is what my recovery program and me working it did for me,” said Choly.